I’m going to do something a little bit different with Canada. Three of Canada’s juniors, Charlotte Mackie, Peng-Peng Lee, and Brittany Rogers — are already exceedingly well-known on the international scene (at least on this side of the pond) and already compete with seniors at internal Canadian events. And though none of the three were age-eligible for the Olympics, they all competed (quite well) in the senior Canadian championships. At that event, Lee placed third, Rogers sixth, and Mackie seventh. So I’m going to focus on girls who are currently competing junior-level Canadian gymnastics in an effort to see who is the next big thing. Pegg is this year’s big winner from the Canadian Junior Championships, where she took the all-around title and placed first on vault and bars, second on floor, and third on beam. Of the second tier of Canadian juniors (that is, those below the three I mentioned above), she is among those with the most experience. Last year, she placed fifth at Championships, behind the three above plus Sky Corbett-Methot, a member of the junior national team who has not been seen in major competition in 2008. In 2006, as a novice, Pegg took the silver in the all-around. Internationally, Pegg’s experience is fairly limited, though she did place sixth in the all-around at Junior Pan Ams in 2007 and fourth in the all-around at the 2007 Romanian International junior competition. By far Pegg’s best placement is in vault: she has placed first on vault at 2006, 2007 and 2008 Championships, and took first on vault at both of her big international competitions. She hasn’t attended Gymnix since 2006, when she placed 12th. Pegg has a very nice UB routine, where she does a nice, high Jaeger and a double tuck dismount with a full twist. Even at last year’s Championships, she had great amplitude and form. Of those I’ll cover here, Pegg is the only one (in addition to Lee, Mackie and Rogers) who will be of senior age next year. Liu placed third at this year’s Junior Championships, and first on beam. (I am pretty sure she qualified on bars, but for some reason she did not compete.) At last year’s Championships she placed ninth. At the 2007 Elite Canada, she placed second all-around, first on bars and beam, and second on floor. Her international experience has been limited: sixth on bars at the Massilia Cup (this year’s edition is coming up), and 13th at Gymnix in the all around, with a fourth-place finish on beam and a bronze on bars. She also competed at the 2007 and 2006 editions of Gymnix, in which she placed ninth and 14th, respectively, and at the 2007 Pan American Games. Liu is an elegant but strong bar worker, and does some nice Staldler work and a big straddled Jaeger. She needs to upgrade, though, particularly on her dismount, currently a piked double back. She’s a natural beam worker, though she still has some wobbles, and does, among other things, a double turn on BB, which we rarely see. Pegg and Liu are both more further along than Keates, but she shows promise. She placed fourth at Junior Championships this year, and qualified to all EFs except vault. She placed only 14th at Gymnix this year, but in 2007 took second on beam and fifth on bars. She was the 2006 Novice champion at Elite Canada, and placed second on beam at that competition in 2007. Coralie Leblond-Chartrand of the Gymnix club placed fifth at junior championships this year, and was the only gymnast to qualify to all of the event finals, thoughs he didn’t place in any. At Elite Canada, Leblond-Chartrand placed fourth in the all-around and took third on beam. She has attended two Gymnix competitions, placing sixth in 2007 and 11th in 2008. Anysia Unick has even less experience on the elite level, but surprised observers by placing second at Championships this year. Finally, Jessica Dowling was the only other competitor at this year’s Championships to qualify to more than one event final: she qualified to three and placed in all of them, taking third on bars and floor and second on beam. Here’s where I’ll mention the big three. They are pretty excellent, wth AA scores routinely in the mid-to-high 50’s. Rogers took second at Gymnix this year, and placed seventh in 2007. She also placed sixth at Pacific Rim, where she also nabbed the bronze on vault and bars. Internally, she placed first at last year’s Junior Championships, taking the silver on bars. Mackie had the best showing at Pacific Rim this year, placing fourth, and also took fourth at Gymnix, along with a gold on vault and two bronzes on beam and floor. She also took third at the 2007 Yokohama Championships. Lee may be the best of the three. Lee was second to Rogers at last year’s Championships, but took fifth in the all-around and second on bars, both over Rogers, at this year’s Pacific Rim. She also placed fifth at 2007 Pan Ams. Recently, Lee’s gym closed and she is now training privately, but observers don’t seem to think this is affecting her. The one problem for those looking for Canada to move to the next level is that Rogers, Mackie and Lee consistently get the choice international assignments, so the rest of their team has little experience. This could prove problematic in building a strong Worlds team, but on the other hand 2009 Worlds consist only of individual competitions. Even as we move into the quad, the new 5-3-3 format means that smaller teams with fewer all-star competitors may actually do quite well. With these three competing at the level of many juniors from top countries, Canada could be looking to place itself squarely in the top eight. For this to happen, however, those juniors still competing at that level will need to upgrade: no one is vaulting anything above an A-score of 5.2, and floor A-scores average around a 5.0. Greeley will become a senior in 2009 and is currently, by my calculations,t he most outstanding junior. At the Australian Nationals in May, Greeley took second to Emily Little (see below), but generally speaking she is the best performer on the team, especially internationally. Despite the second-place finish in the AA, Greeley medaled in three EFs, taking gold on bars, silver on beam and bronze on floor. 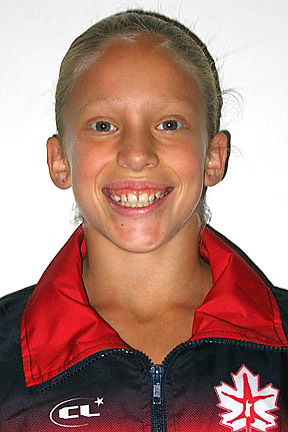 At the 2007 National Clubs meet, Greeley took fifth in the junior AA and second on beam. She was seen in international competition as early as 2005, taking 11th in the AA at the WOGA Classic. She took fifth at the 2008 edition of the Classic. She has also been sent to the Pacific Alliance (2006) and Pacific Rim (2008) meets. In the latter, she took 10th in the AA and finished seventh in beam EFs. Greeley’s best event may be BB, although she is actually more of a steady competitor than a trickster on that event. At WOGA this year, she competed only a layout full dismount, which may be evidence of trouble on (what I assume is) her higher-difficulty dismount. On UB, Greeley is a bit labored but has very nice lines, and the former would probably go away with a little strength training. She does a nice full twisting double tuck dismount. Greeley’s FX music makes me want to stick a screwdriver in my eardrum (it is a combination of “Heaven is a Place on Earth,” the techno version like in Shawn Johnson’s 2005 FX AND “Careless Whisper). She competed a back double tuck at this year’s Nationals, and does some nice twisting work. Good precision. Little took the gold from Greeley at this year’s Australian Nationals. She competed Australian Level 10 through 2007 Nationals, but then competed as a junior international elite at the 2007 National Clubs, where she placed second in the AA (above Greeley), and took three EF medals: gold on floor, silver on vault and bronze on bars. At this year’s Nationals, she took home two golds on beam and floor. Little has really competed only at one major international event, the 2008 Pacific Rim, where she finished 11th in the AA and took fifth on VT. I haven’t seen much of Little’s work, but her FX is cute enough, with bouncy almost circus-like music, a double pike mount, and a pretty 3/2 twist dismount. The Australian juniors have very little international experience, and Turnbull in fact has none. However, she is currently rising fairly quickly through the junior ranks, and placed fourth at this year’s Nationals with a third-place finish on bars. She made several mistakes in that competition and likely would have placed higher otherwise. At last year’s National Clubs she took sixth in the all-around and third on vault. In fact, I chose Turnbull for third in front of several other contenders precisely because of her vault: she is currently competing a 3/2 Yurchenko, and I believe she is the only Australian junior to do so currently. Turnbull is a fairly powerful gymnast, clearly, and shows it also on floor, where she has decent tumbling that includes a nice full in double back. Inexplicably, however, her music choice is a techno remix of “Dragostea din tei.” The British would say the Australians were never known for their taste …. Two injured gymnasts deserve mention. Mary-Anne Monckton, who placed fifth and took silvers on beam and floor in a strong field at last year’s Nationals, was injured for the 2008 season. She also competed in 2007 in the Australian Youth Olympics, a relatively important competition for juniors from Commonwealth countries, placing 24th and taking second on floor. She also competed at Massilia in 2006. She is quite tiny and needs some work on bars and vault. Another injured junior of note is Tain Molendijk, who was 13th in the AA at the 2007 AYO and traveled to the Pacific Rim Championships in 2008 only to have to withdraw beacuse of injury. Finally, Karina Brooks took third at this year’s Nationals and medaled in three EFs, with two silvers and one bronze in EFs (silvers on bars and floor, bronze on beam). She was seventh at Nationals in 2007. Australia looks to have a quite strong team for the future. While we are not sure about all the retirements yet, we do know that the famed Dasha Joura is planning to continue, for now at least, after a disappointing Olympics. There is also a whole set of new seniors who were not quite ready for the Olympics but competed well against the Olympians. (They are the Corrie Lothrops, Chelsea Davises and Mattie Larsons of Australia.) First is Emma Dennis, who won the 2007 Junior Nationals and placed sixth at this year’s combined Nationals/Olympic trials. Dennis was seventh at the 2007 AYO and third at Yokohama in the AA and on floor. She is a decent vaulter and quite good on beam. I like Dennis best on FX. She does a high full in, some nice twisting, a decent double pike, and is quite elegant. She also uses a classical piece for her music, which you don’t see much of anymore. She does a 3/2 Yurchenko vault. Dennis was on the Olympic team training squad and was the alternate for the 2008 Olympic team. Amber Fulljames was also a member of the 9-gymnast Olympic training squad and was second at 2007 Nationals and eighth in 2008 at her first senior Nationals. Last year she laced in three of four EFs, missing only on FX. Fulljames was 13th in the AA at the 2006 Pacific Alliance Championships, 11th at Yokohama, and ninth in the AA in the senior division of the 2008 Gymnix International. Finally, I would also mention Yves Berryman, third at 2007 Nationals and 10th this year, and Larissa Miller, a good UB worker who placed fifth in 2007 and 12th in 2008. The junior gymnasts have a ways to go, but I think that if these new seniors choose to stick around, Australia will actually prove to be quite competitive in the next quad. 1 Response to "Up-and-coming juniors Part IV: Canada and Australia"